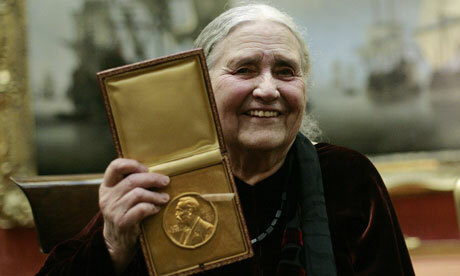 Doris Lessing who won the heart of many with her literature and in 2007 was awarded with the Nobel Prize for Literature died today. She was 94. Famously outspoken, the diminutive grande dame of English literature was too old not to scoff at the honor — “a bloody disaster,” she called it later, which left her no time to write. Her publisher, HarperCollins, announced her death, saying it was peaceful. A school dropout at the age of 14, Lessing was known for her wide-ranging and impatient intellect, honed by her own keen curiosity, her grounding in two continents — southern Africa, where she grew up, and Britain, where she spent most of her adult life — and her insatiable appetite for books, including Russian novels, Moorish history, science fiction and Sufi mysticism. She wrote more than 50 books of extraordinary range, exploring the social and political conflicts of her day, the colonial experience in Africa, the possibilities of extraterrestrial life — and most memorably, the conflicted recesses of the female heart. The Nobel committee called her an “epicist of the female experience, who with skepticism, fire and visionary power has subjected a divided civilization to scrutiny.” The divides Lessing plumbed were black and white, male and female, terrorist and socialite, even human and alien. Miss Universe 2011 Leila Lopes faked Documents? Godzilla 2014 Movie Trailer Released! CMA Awards Red Carpet Photos!